Plastics ancillaries manufacturer, Jenco, has announced the launch of BlendSave™, a multi-channel batch blender that optimises raw material flow management. BlendSave is a centralised blender consisting of up to 14 individual weighing chambers fed directly from silos or containers, a common funnel and an automatic manifold for distributing whole batches to the appropriate processing machine. BlendSave works by simultaneously weighing all needed resins and additives for each recipe within its 14 weighing chambers dedicated to a specific raw material. It then releases the entire batch into a common funnel, before being sent via an automatic manifold and tubing to the corresponding processing machine. As opposed to the traditional gravimetric batch blender, which is limited to the number of machines it can serve due to the multitude of formula variations, a single BlendSave takes up only 52 metres of space and supports up to 24 processing machines. BlendSave is unique in that it enables multiple systems to intercommunicate, thereby creating a platform that is theoretically unlimited in how many raw materials and colour recipes can be processed, and how many processing machines can be supplied. For applications where weight accuracy is of utmost importance, BlendSave provides consistent, high resolution weighing within 0.01g by utilising a combination of multi-step weighing and small load cells. Following material weighing, the complete batch is dropped into a common funnel and automatic manifold. It is then passed through a mixer within the free fall hopper located at the extruder inlet to ensure optimal batch uniformity. This highly-accurate and fast flow enables BlendSave to service manufacturers’ most demanding requirements. When considering an example of a factory with 10 raw materials and 96 injection machines processing 1.2 tons/hour, the typical factory will utilise 50 four-bin gravimetric batch blenders, 200 hopper loaders, and a complex network of plastic tubing. By integrating BlendSave, the representative factory will feed all 96 processing machines with only 4 BlendSave systems, 40 hopper loaders, and 96 mixers, while taking up just 20 square metres of space and spreading out a simple tube arrangement. When considering the possibility of 4 integrated BlendSave systems, the total required floor space is only 20 sqm. BlendSave’s dedicated weighing chamber for each raw material fed directly from the material silo eliminates the need for batch blender sterilisation and makes the entire process of switching between jobs exceptionally easy. Furthermore, within the common funnel and distributor pipe of the automatic manifold, BlendSave uses a high-pressured air blast between each batch to sterilise the area and prepare for the next batch of raw materials. Standard gravimetric blenders weigh batch components in a serial order. 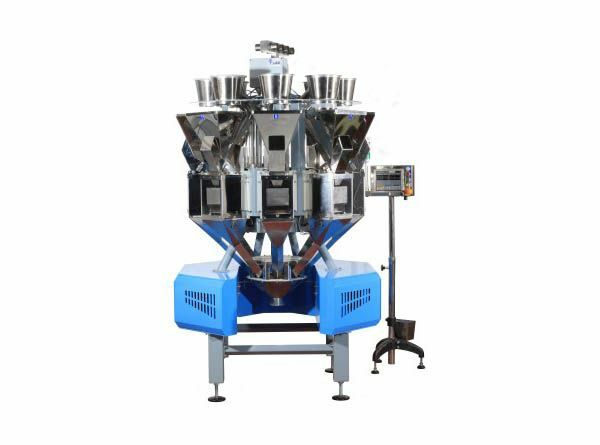 Each component is dispensed separately into a single, common weighing chamber, from which they are all subsequently dropped into a mixing chamber before being vacuumed to their respective injection line. This method of serial weighing limits the speed with which a blender can release a batch. 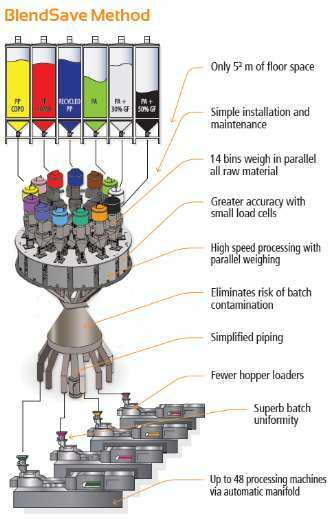 BlendSave improves production speed by dedicating a weighing chamber for each individual bin; weighing in parallel all batch components. In addition to the enhanced speed, time savings and eliminating the risk of batch contamination, BlendSave uses smaller load cells; affording higher batch accuracy with a relatively high throughput. By utilising BlendSave, factories have access to continuously updated information concerning equipment and material efficiency. As all the raw materials flow through a common system, BlendSave affords managers full monitoring and control of job status, batch auditing, historic graphs and performance reports for each machine and job via an interactive PC dashboard. BlendSave enables factories to improve efficiency by simplifying the flow of raw materials and reducing the need for capital equipment. Man-hours which used to be spent on batch preparations are dramatically reduced, while additional factory space is now used for other revenue-generating activities. Jenco has been providing ancillary solutions to the plastics marketplace for over 50 years. Their continuous commitment to support customers and their requirements is demonstrated by their ability to provide the flexible manufacturing of systems and equipment to suit the customer’s needs. Trials and demonstrations can also be arranged in their test facility in Northamptonshire. Visit Jenco’s website for more information.